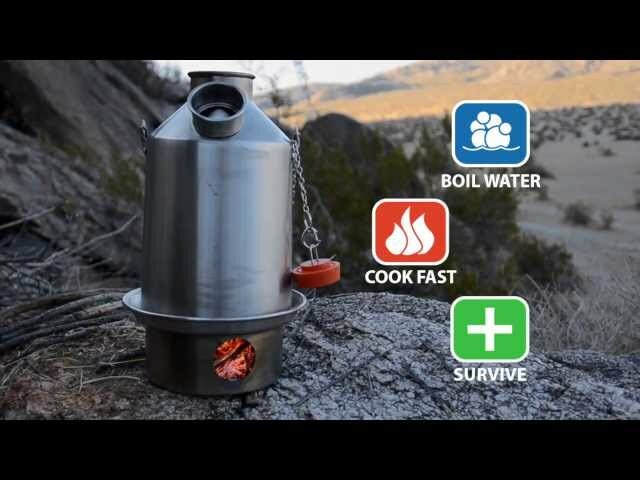 The Kelly Kettle is the ultimate cook system for recreation, survival and preparedness! The Base Camp is the largest Kelly Kettle model and is ideal for use as a group (3-4 people). The Kelly Kettle is a kettle and rocket stove in one, no other cook system boils water as fast or is as versatile. The only fuel the Kelly Kettle needs to operate is literally a handful of sticks, twigs, or other naturally occurring tinder in the environment such as dried grass, leaves, pine cones, bark, etc. Each Kettle comes with a fire base (Also called a fire dish) that has a draft hole in it; you put whatever you are going to burn in the fire base and light it up, once ignited put the kettle on the fire base and in as little as 3 to 5 minutes you will have boiling water (time to boil depends on the type and amount of fuel you are burning). The Kelly kettle is the perfect cook system to pair up with freeze dried foods - which only require boiled water to prepare or re-hydrate. Kelly Kettles are available in Stainless Steel and Aluminum: Stainless Steel Kettles are more durable and will last longer. Aluminum Kettles are lighter weight and are preferred for backpacking. Stainless Steel Base Camp Kettle holds 54.oz of water. Comes with a high temperature Silicone Rubber stopper to plug the kettle to carry water or to seal the kettle to prevent unwanted debris from getting into it. The stopper is permanently attached to the side of the kettle with a chain. The chain keeps the stopper from getting lost and is also used to assist you to pour the water out of the kettle without getting burned. Hobo Stove: Turn your Fire Base into a stable cook stove by adding the Hobo Stove on top of it. Now you can cook with larger pots or skillets without the Kettle. Large Cook Set: This Cook Set comes with Pot, Pot Lid that can also be used as a Skillet, Gripper Handle and Grilling Grates for use on the Fire Base. Cook Set can be used on the hobo stove or on the Pot Support. Pot Support: This Stainless Steel Pot Support fits into the top of the Kelly Kettle creating a cook surface to use while you boil water, harnessing the heat from the fire rising up through the middle of the Kettle like a chimney. As it is not as stable of a cook surface as the Hobo Stove, it is recommended to only use the Kelly Kettle Cook set and not larger pots or pans when cooking on the Pot Support. Camp Cups: The Kelly Kettle Camp Cups are a pair of Stainless Steel cups/mugs (12 oz & 17oz), that have folding handles, are very durable, and have "cool lip guards" on them to help prevent you from burning your lips while drinking. The 12oz cup nest inside the 17oz cup and fits nicely in the Cook Set's Pot for storage. The Kelly Kettle and all of the available accessories nest and pack up into the kettle's base and compactly fit into a carry bag that comes with each Kettle. Take caution when removing the Kettle from the fire base, remember the top of the Kettle is a chimney. When pouring water out of the kettle when the kettle is hot, lift the kettle using the handle with one hand while tipping/pouring the kettle by lifting the chain with stopper attached. You should also let the pot support cool down before trying to remove it from the kettle.